Okay, so Federation Commander keeps getting requested at my house. This is the third or fourth time, now. The two boys (aged 11 and 12) insisted that we use squadron scale this time. The twelve-year-old wanted everyone to play their own ship– including me. (Me, I want them to learn more of the rules, more of the tactics, and play shorted duels so that it is clear what’s going on. They want to make epic scenarios.) With the excitement reaching a fever pitch at the kitchen table, this becomes a major social event. As such, my daughter (age 8) ends up wanting to join in. Now, the thing about gaming with kids…. One kid makes a passable gamer. Two kids make half a gamer. Three kids? No gamer at all! As you add more and more kids to the game, the chaos rises exponentially. I’m amazed that I can keep some semblance of a game going in between the fart jokes and the poking. But you know, it actually sort of worked a good chunk of the time. If you keep in mind that your main objective at this point is to normalize gaming as a viable activity that can just spontaneously happen at any time, then the session will make more sense. The twelve-year-old laid out as many map sheets as would fit on the table. Everyone picked out their ships and it ended up being my son and daughter teaming up in D7’s while I and the twelve-year-old flew a Federation Heavy Cruiser. We came on the board and my son decided he wanted to shoot his sister in the back at range 8. She turned and could not get her disruptors in arc, so she answered back with several phasers at range 3 or so. We slogged through the next several impulses which I decided to mark with the projector pens on the reference sheet. At impulse eight, the Federation unloaded on my son’s D7, but through two different shields. (The twelve-year-old was at range 5 and I was at range 8.) We did a good chunk of damage and then followed through with phaser fire on impulse one of the next turn. This gutted the D7 and I called the game. It was bed time for my two at this point and let me tell you, it is ten times as hard to get them ready for bed with a big mess of Federation Commander stuff spread out everywhere! The twelve-year-old begged me to keep playing with him, but it was impossible to focus on anything in the chaos of my kids bedtime routines. I tried to help him use the time he had before his dad showed up to learn a few more rules, look at some of the other ships in the game, and plan our next scenario. I got out the battleships ship cards and the kids’ minds were completely blown. The twelve year old asked me if you could a Klingon B10 verses a Federation frigate would be like the battle in the opening to the 2009 Star Trek movie. (I told him yes.) My son said he wanted to design a ship card of his own: a frigate that had shields like a battleship! So much stuff here to get into…! This game is a very big deal for the kids. The twelve-year-old wants to know what can be done with every box on the card. He is blown away by the way that the game presents an accessible working model of Trek that he can play with. At one point he’d climbed up on a chair and had taken down my Romulan ships and started making “pew pew pew” sounds. He has no concept yet of what good play or good tactics would look like, but he wants to play a frigate duel as badly as he wants to play a battleship duel. It’s interesting to me as well that he hasn’t discovered the other races, yet– the Kzinti ships I showed him just left him cold. 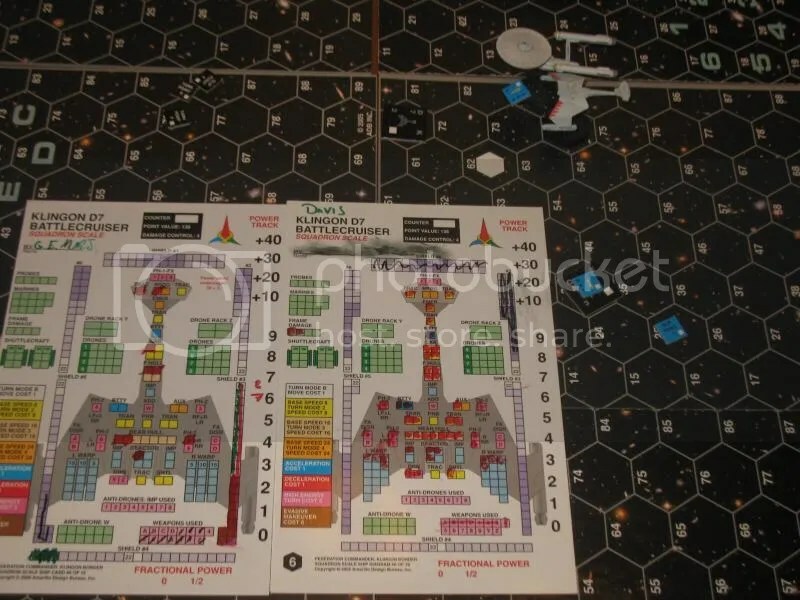 Starbases, though…? He wants to play a game with that unit as soon as possible! He could totally play this game for hours no matter how insane a scenario he comes up with– the more stuff, the more guns, the better as far as he’s concerned. I talked him into letting me pick the scenario every other session, so we’ll see how that goes…. The more I read your FedCom posts, the more I am leaning towards picking it up! I’m trying not to pimp it too hard, but when a twelve year old trek fan and aspiring astronaut goes this nuts for it, it’s hard not to get into it. I’ve played other games from my shelf with him, but I realize he’s always had an eye on that Star Fleet Battles box…! Well, of course. It would have been better for me to learn Panzer Leader playing the intro scenarios, but I wanted to play D-Day with it. Guess which was more fun as a kid? The dude just told me he wants to play battleships versus a starbase defended by frigates. I’m afraid, Peter. I’m… truly afraid.